The goal of the Strategic Sourcing Program at the University of California is to take advantage of the combined purchasing power of the 10 UC campuses to cut costs for common goods and services. The objective of this project was to obtain insights from a large dataset of department/supplier transactions to understand how the UC system could reduce costs in the supply chain network. A social network analysis and a natural language processing team were organized by the Data Science Collaborative at the Berkeley Institute of Data Science work on the analysis. I headed the social network analysis team. The analysis had two objectives. The first was a macro structural analysis of the supplier networks to visualize inefficiencies in purchasing. The second was a micro-structural analysis to discover which departments had similar networks. The idea here is that if the University could identify the departments buying products from the same suppliers, it could use these multiple purchases as leverage to reduce purchasing costs. We received five years of department/supplier transactions in the University of California system. To reduce the size of the dataset and the complexity of developing analytical tools, , we decided to focus on the University of California at Berkeley. I used Pandas to clean the data and prepare it for network analysis. Strategic Sourcing had an interest in analyzing the efficiency of purchasing in the network structure . A highly connected network indicates greater efficiency because the departments are purchasing from similar suppliers. Conversely, a less connected network is less efficient because the departments are purchasing from a much more diffuse number of suppliers. Network density was used as a measure to understand the connectivity of the networks. Density in social network analysis is calculated as the total number of ties between nodes in a network divided by the total number of possible ties. To obtain accurate density calculations, the network was converted from a two-mode to a unimodal network. The graphs reveal that for catalog purchases, the departments are purchasing from a group of similar suppliers. The departments in the non-catalog network, on the other hand, are purchasing from many different suppliers. 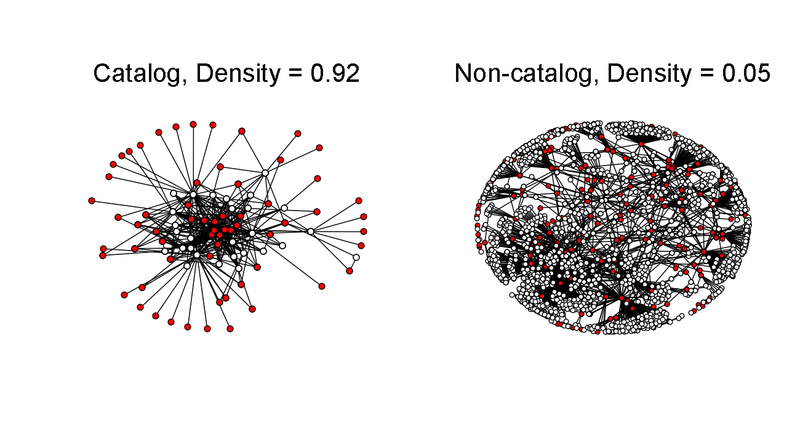 Most importantly, the tree structures at the periphery of the non-catalog graph show that many departments are sourcing their products from several niche suppliers. 3. Which departments have a similar supplier network? Sourcing is considered inefficient when departments purchase products from the same supplier without coordinating their transactions with other departments in the University. The beauty of social network analysis is that principals of structural similarity (homophily or structural equivalence) can be visualized in the network. Nodes that are closer together in the network graph are more similar than nodes that are further apart. 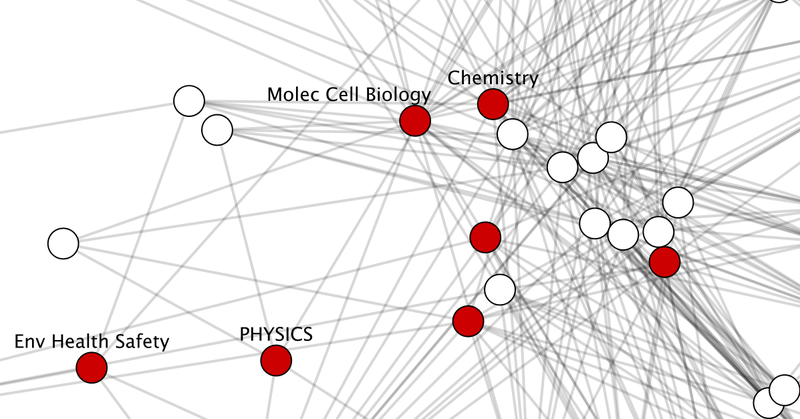 For example, if we are interested in Molecular and Cell Biology (MCB), a visualization of the department position (red notes) in the network will show which departments have a similar supply chain network to MCB. Departments that are nearest to MCB, purchase products from a similar group of suppliers and departments that are further away do not purchase from the same group of suppliers. The visualization and the similarity score show that Molecular and Cell Biology is closest to Chemistry with a score of 0.67, and furthest from Environmental Health and safety with a sore of 0.10. In addition, Network X can be programmed to list the suppliers they have in common.